Sigh!! Just 9 days left... Can't believe it.. 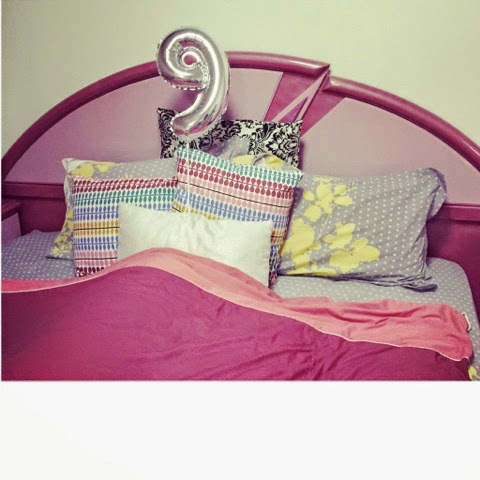 Came back home and saw this 9 balloon reminding me that 9 days left. My fiance sent it for me. I'm sure I'll probably be receiving it every day. Today was a hectic day, my dear friend as well as my make up artist for the wedding came to see my outfits. So the basic trials, hair ideas and draping of the chunni. This took around 3 hours of the day. Then went for my laser appointment (which my lovely sis-in-law) reminded me off. After that rush to the decor vendor, to discuss the final touches, but we would need another session on Monday to complete it. Then I went on a hunt for hair extension and fake lashes that my make up artist suggested to buy. But didn't end up getting anything. I will probably try to see tomorrow. I ended up my day with a facial. Felt so relaxed and completely shut down myself with a snore during the session. In few minutes I would be leaving to pick up my first international guest. My massi is arriving from Ohio for our wedding. Super excited to see her.